The project aims to demonstrate the use of mobile ad hoc networks in an environment where fixed network infrastructure is not available, such as in the case of natural disaster. Operations of heterogeneous networks in emergency conditions will be explored. The experiments will provide feedbacks for further enhancement of related network and application protocols for emergency situation. Emergency network is a network which can be deployed in an emergency situation such as for rescue operations after an occurrence of a natural disaster. It does not rely on fixed telecommunication infrastructure hence can be set up within a relatively short period of time and with little effort. The network should sufficiently serve the demand of rescue operation and the disaster recovery communications. An example scenario is as shown below where mobile ad hoc networks are deployed. 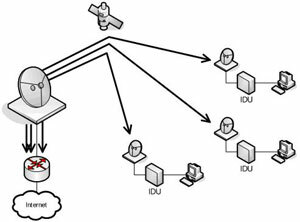 The Internet part of above scenario can be a wireless satellite communication. Rescue workers can communicate among each other using VoIP or short messages. Sensor data and streaming VDO can be sent from each mobile site to the central coordination unit. Similarly commands from central co-ordination unit can be broadcast to all mobile sites. The central co-ordination unit can be anywhere in the Internet cloud.